Rabbit Syphilis. Cause and symptoms of vent disease, making the diagnosis, how to cure. Plus diarrhea alert due to treatment with antibiotics. Pictured below is the vent area of a dwarf lop doe. The doe has contracted bunny syphilis from a recent breeding. 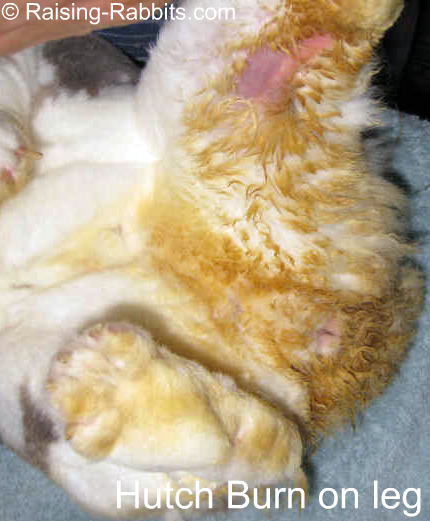 This is also known as vent disease, vent disease in rabbits, spirochetosis, or treponematosis. The causative organism is a spirochete bacterium named Treponema paraluis cuniculi, or sometimes simply T. cuniculi. From the time of exposure to rabbit syphilis, the disease incubates for around 3-6 weeks. At onset of symptoms, the genital area becomes inflamed and swollen with superficial, cutaneous lesions. Little blisters and/or ulcers develop over the vent area. These pop and scab over. The area may be coated with pus and yellow exudate. Affected animals are typically unwilling to breed, and if they do, their reproductive efficiency drops. Transmission of vent disease in the vast majority of cases is through breeding. However it is possible to contract the disease through normal contact. Without treatment, similar scabby, inflamed lesions can develop on the nose, lips, face, and/or eye region as the rabbit infects itself through grooming or coprophagy. Facial sores develop in about 15% of affected rabbits. The rabbit pictured did not yet have any facial sores. In a few rabbits with vent disease, the still-infectious rabbit becomes completely asymptomatic. The outward lesions heal, yet the spirochete is still populating the bloodstream. 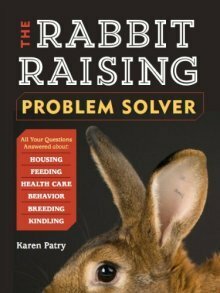 If you breed a rabbit and the other animal comes down with rabbit syphilis, treat both animals. Because vent disease is so contagious, do quarantine the affected animals, all those rabbits that have been exposed to them, AND all their offspring which could reasonably be suspected of having been exposed to the disease. A veterinarian can take a scraping of the area and put it under the dark field microscope. (S)he should be able to see spirochetes (tiny corkscrew-shaped bacteria) under the slide. The vet can also measure the antibody titer. Other serologic tests are also available. Even if a spirochete cannot be found, I would nevertheless treat any of my rabbits that ever resembled the picture above, plus any animals they had been bred to. Hutch Burn or Vent Disease? It might be possible to confuse hutch burn with vent disease. Hutch burn is a topical irritation to the skin, most frequently from sitting in moist or dirty bedding. The fur will be stained and/or missing. 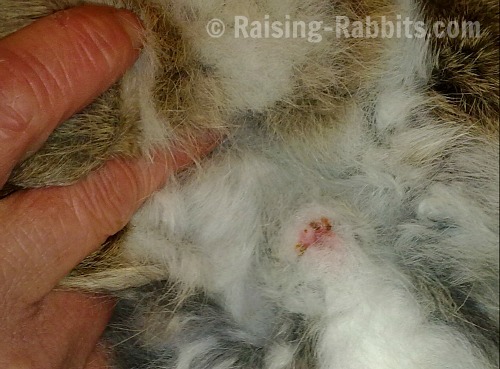 The vent area of this rabbit is perfectly healthy, while the surrounding fur is stained. Hutch burn can be seen on the inner leg, where the fur has fallen out and the skin is reddened but not scabbed. Find more hutch burn info on our Rabbit Health Care page. The treatment of choice is penicillin. Be very careful which penicillin is chosen, as some penicillins will wipe out the rabbit’s intestinal flora resulting in death. Antibiotics by mouth is NOT recommended. Procaine penicillin G, 40,000 IU intra-muscularly, once a day, for 3 to 5 days. A mixture of both Procaine Penicillin G and Penicillin G Benzathine. The combination goes by a variety of brand names. 'Dura Pen' is one of them, Pen BP-48 is another. Dosage is 20,000 IU per pound of body weight, subcutaneously, once a week for 3 weeks. The actual amount of antibiotic you draw up into the syringe will depend upon both the weight of the rabbit, and the concentration of the Penicillin in the vial. Double- and triple-check everything carefully before injecting. Give the full treatment. You need to heal the scabs AND kill the spirochetes throughout the body. Treat ALL adults in the herd if necessary. Recovered rabbits that have been treated can be considered cured and no longer infectious. Expect the vent and other lesions to heal up within 10-14 days. Diarrhea is a definite risk whenever administering antibiotics to a rabbit. You should probably withhold pellets for the first couple days after administration. Instead, free-feed grass hay, which will reduce the rabbit's intake of calories and carbohydrates. The reduced energy intake will help limit the proliferation of diarrhea-causing unfriendly bacteria triggered by the partial die-off of normal gut bacteria from the antibiotics. Do not breed infected rabbits. Besides the danger of spreading this infection throughout the herd, the kits themselves become infected by the infected does at kindling. It is very dangerous to treat infected bunnies with penicillin - the bacterial balance in their intestines is still tenuous; a dose of antibiotics could very easily trigger a fatal diarrhea. If at all possible, it is safest to postpone treatment of youngsters until much closer to adulthood. Antibiotics: Sulfamonomethoxine, Chloramphenicol, Baytril (enrofloxacin). These have only limited effectiveness against T. cuniculi. The likely outcome is temporary suppression of symptoms, allowing the infection to roar back once the antibiotic is discontinued. Obtain a culture and sensitivity before using antibiotics, and especially if considering the use of any of these antibiotics. Ointments: Panalog (anti-fungal and antibiotic), Fluoroquinolone (dangerous antibiotic ointment). Despite their broad-spectrum effects, ointments have value because they may improve the rabbit’s comfort level but they will not reduce the bacterial count and cannot be considered the sole means of treatment. Except in the case of preventing a secondary infection, consider using a non-medicated salve if necessary. Find the initial source of the infection, if possible. Rabbit syphilis is a disease that you may never see in your herd or your pet. On the other hand, it is severe enough that you should be aware that it exists. It is a wise breeder that checks the business end of both breeding animals before every mating to ensure that both animals are healthy. Deep cleaning and disinfection of hutches, cages, and the rabbitry is important to prevent a possible re-infection of one or more animals with rabbit syphilis. With effective treatment, rabbits can be expected to return to excellent health. Rabbit's vent after just 7 days of treatment. It's healing nicely, with a few scabs remaining. 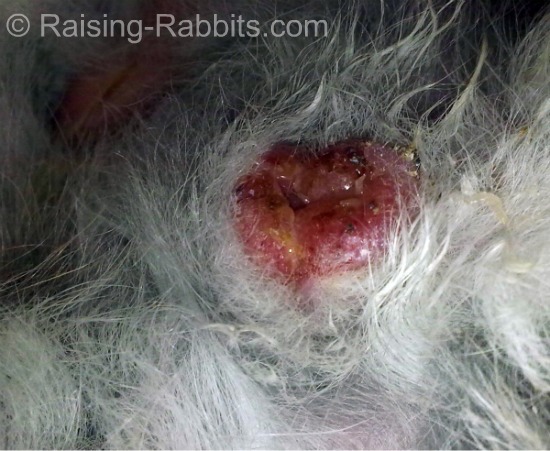 Rabbit's vent after 14 days of treatment. It looks to be fully healed.